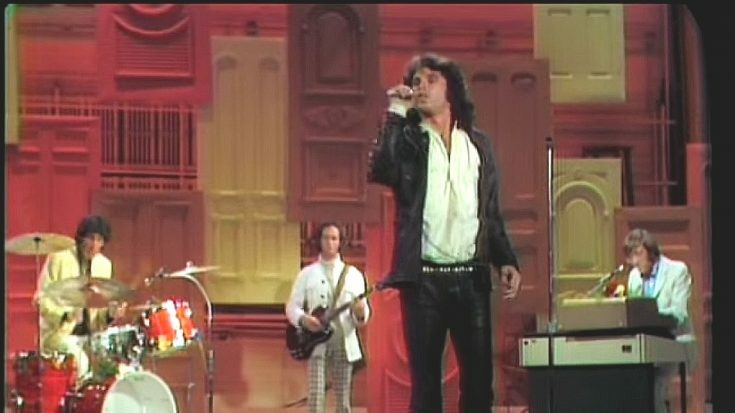 Emerging from the rabid California music scene with flourish and no shortage of compelling, commercially-viable material, The Doors seized 1967 as the American band of the moment. Though Jim Morrison’s burgeoning stage presence and lyrical prowess accounted for most of the early appeal, the group represented one of the more well-rounded and versatile rock acts in the country. Buttressed by Robby Krieger’s varied influences (ranging from slide-laden Delta blues to flamenco), John Densmore’s jazz-inspired and surprisingly forceful drumming, and Ray Manzarek’s virtuosic keyboard work and arranging faculties, the band readily distinguished itself from the 12-string-loving Byrds disciples, “San Francisco Sound” exponents, and garage rock outfits that by the end of 1966 had come to epitomize rock in America. Though never considered “heavy” in the same vein as contemporaries Vanilla Fudge or Iron Butterfly, The Doors were augmenting reliable grooves with histrionics and frantic instrumental passages even back in the London Fog days. The Doors, released on January 4, conveyed a breadth and artistic maturity rarely permitted on the often hastily-assembled, unrefined debuts of the era. Even more impressively, the record’s wide range of material found a way to align with commercial tastes. Marked by favorites “Break on Through”, “Soul Kitchen”, “Twentieth Century Fox”, “The Crystal Ship”, Bertolt Brecht’s “Alabama Song”, Willie Dixon’s “Back Door Man”, and Robby Krieger’s first composition, the Number One “Light My Fire”, the record now reads like a greatest hits album even without the culminating “The End” and sold accordingly. Already approaching superstardom, The Doors toured unremittingly in support of the album and a mere eight months later released Strange Days, a follow-up that affirmed the quartet’s relevance and willingness to expand musically. Strange Days, like its predecessor, spawned indelible additions to The Doors’ catalog and actually managed two Top 40 showings in “People Are Strange” (#12) and “Love Me Two Times” (#25) before reaching #3 on the Top 200 Album Charts. Nevertheless, the album was regarded as vastly disappointing in the wake of the success achieved between January and August. The release also coincided roughly with the group’s storied appearance on The Ed Sullivan Show on September 17, which should have ensured superior sales figures. Aided by stronger, fuller overall production, the album progressed (to the dismay of some) from the “live” feel on the first record to resemble a more professional studio effort but, by refining The Doors’ sound, lacked such incredible stylistic diversity or shock value. “When the Music’s Over”, the eviscerating conclusion, incurred derision or was discredited outright given its similarity in length and structure to “The End” despite likely eclipsing that song musically and the obvious differences between the pieces. Though, objectively, these aspects should not have detracted from the album’s standing, decades passed before Strange Days garnered appropriate acclaim. Regardless of the tepid reception earned on release, Strange Days included substantial album cuts alongside the hit singles. “Moonlight Drive”, penned by Morrison even before the formation of The Doors, unfolds through Krieger’s winding slide work and Manzarek’s bouncing, soulful keys, while the immersive title track features one of the first uses of the Moog synthesizer in rock and a sardonic, socially-dismissive Morrison lyric. “You’re Lost Little Girl” and “I Can’t See Your Face in My Mind” follow in the deliberately-hazy, “psychedelic” tradition with appropriately brooding turns from Morrison, though this sound is expanded upon with the more straightforward “My Eyes Have Seen You” and its driving riff. The aforementioned “When the Music’s Over”, however, decimates the proceedings with a grandiose, exceptionally well-structured exercise in dynamics that sustains its intensity even during Morrison’s poetic passages. Rather than render a sustained, consistent backing for the singer’s couplets (as in “The End”), the band drops down to just Manzarek’s beguiling “bass” line and gradually opens up to allow Densmore’s flailing interjections. Morrison commands the mood completely and paces himself remarkably well, giving Densmore the opportunity to counter the vocals with mounting drama. Everything appears to be subsiding, only for Morrison to loose his “We want the world and we want it now” call and send Densmore into a thrashing build-up. Just as Densmore seems about to burst out of the speakers, the drummer pulls up and leaves Morrison suspended to let out his greatest scream on record before the band commences the rest of the destruction. In retaining the loose feel of “The End” but presenting an even stronger musical basis and overall sound/production, The Doors arguably found in “When the Music’s Over” the consummate representation of everything that made the band worthwhile. Worthy of note as well is Krieger’s triple-tracked, discordant solo that at the time stood as by far his most impressive achievement and portended the heavier layering of guitars that would gain popularity in the 1970s. Strange Days thus (if not commercially, then certainly musically) cemented The Doors’ international prominence and permitted the successes to follow in 1968. Alongside these exemplary studio efforts, The Doors’ live act progressed startlingly within a matter of months. By the year-end performances at Winterland, The Doors had become a premier concert draw based as much on instrumental renown as radio presence. These three consecutive dates assured the group’s stature at the top of the heap and, though only partially recorded, mark resounding successes; the final show also supplies the earliest live record of Waiting for the Sun‘s “The Unknown Soldier“. Even earlier, the group’s July 4 concert at San Bernardino’s Swing Auditorium had already shown considerable development, especially when compared to the officially-released March appearances at The Matrix. A similar leap in quality occurs between that date and the hour-long assault delivered in Danbury, Connecticut in only October of 1967. A version of “When the Music’s Over” from the first night at Winterland is included below. Following the “We Want the World” intermission, Morrison sings, “Poor Otis dead and gone, left me here to sing his song” in reference to the recently-deceased Otis Redding; the lyrics appear formally as the opening to “Runnin’ Blue” on The Soft Parade (1969). Krieger, meanwhile, manages to reproduce (if not outdo) the torrential effect of his studio solo despite the lack of harmonizing/tape delay effects to compensate for overdubbing.